Abstract. We consider the flow of marine-terminating outlet glaciers that are laterally confined in a channel of prescribed width. In that case, the drag exerted by the channel side walls on a floating ice shelf can reduce extensional stress at the grounding line. If ice flux through the grounding line increases with both ice thickness and extensional stress, then a longer shelf can reduce ice flux by decreasing extensional stress. Consequently, calving has an effect on flux through the grounding line by regulating the length of the shelf. In the absence of a shelf, it plays a similar role by controlling the above-flotation height of the calving cliff. Using two calving laws, one due to Nick et al. 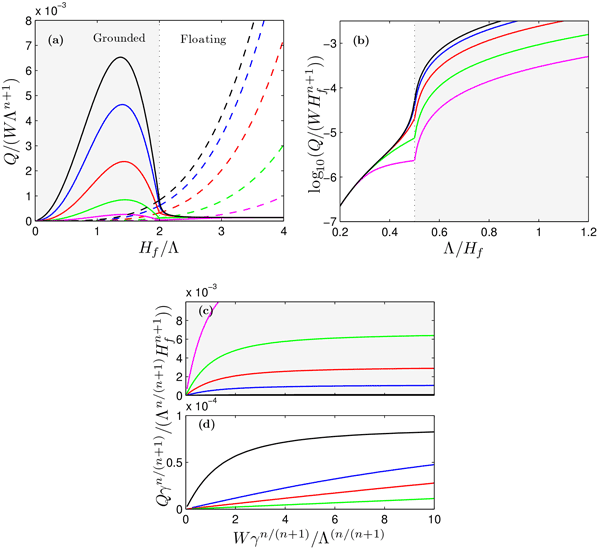 (2010) based on a model for crevasse propagation due to hydrofracture and the other simply asserting that calving occurs where the glacier ice becomes afloat, we pose and analyse a flowline model for a marine-terminating glacier by two methods: direct numerical solution and matched asymptotic expansions. The latter leads to a boundary layer formulation that predicts flux through the grounding line as a function of depth to bedrock, channel width, basal drag coefficient, and a calving parameter. By contrast with unbuttressed marine ice sheets, we find that flux can decrease with increasing depth to bedrock at the grounding line, reversing the usual stability criterion for steady grounding line location. Stable steady states can then have grounding lines located on retrograde slopes. 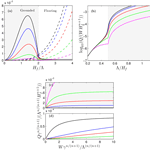 We show how this anomalous behaviour relates to the strength of lateral versus basal drag on the grounded portion of the glacier and to the specifics of the calving law used. How to cite: Schoof, C., Davis, A. D., and Popa, T. V.: Boundary layer models for calving marine outlet glaciers, The Cryosphere, 11, 2283-2303, https://doi.org/10.5194/tc-11-2283-2017, 2017.